Underground self parking very inconvenient. In room coffee inconvenient to use. Stored in the closet along with the ice bucket. Automobile valet service was disorganized. Desk service personnel very professional. Room was clean, bathroom clean. Linens very nice. Bed was comfortable. Outside- hotel appearance is very impressive. Location of my room, bathroom amenities, excellent desk service. Location of the ice bucket, the coffee maker dirty/ no coffee. We truly enjoyed our stay at the Hyatt, it is a beautiful hotel! Beautiful hotel, close to everything. Parking very pricey, food by pool was poor. Clean, upscale decor with a modern feel. Don't forget to account for parking fees ($18 when I went). Modern decor, fresh flowers, friendly staff. Bottled water was $5 a pop, parking was $18. The Hyatt Regency La Jolla at Aventine, nestled in a luxurious seaside suburb known as the Jewel of the Pacific, has 419 remodeled guestrooms and spacious VIP suites. The property is within minutes of many company headquarters and world-class shopping and dining. It is the ideal location for upmarket leisure travelers and executives seeking quality accommodation and facilities. The hotel was designed by architect Michael Graves and is a masterpiece of imported Italian marbles, exotic woods, custom designed furniture and ancient art. For functions and special occasions the hotel has 32,000 square feet of meeting space including the 11,800 square foot Aventine Ballroom and the glass-enclosed The Pavilion adjacent to landscaped gardens. The least expensive rooms measure 375 square-feet and have views of the pool or restaurant row. They are decorated with sophisticated West Coast flair and there is a choice of one king bed or two double beds. Amenities include work desk with Internet access, minibar, iron and ironing board, coffeemaker, satellite TV with videos on demand, hairdryer, windows that open, dual line telephones with voicemail and speakerphone and electronic door locks. Room service is available 24/7. 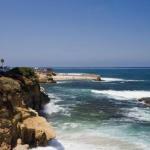 Those who have stayed here say the location in La Jolla makes a perfect vacation spot. Dining in what the hotel terms its restaurant row, is pricey but excellent. Experienced and professional employees are another major plus. Nearby attractions that many have enjoyed include the San Diego Zoo and Wild Animal Park, Sea World, the beaches, La Jolla shopping, and the parks and the museums. Parking: Yes, there is parking. Valet parking costs $23 per day including in and privileges and self parking $17 per day.